This month I am writing to you from Padstow, a small coastal fishing village in the beautiful county of Cornwall, southwest of England. Padstow is now famous for the very successful restaurant(s) and shops belonging to Rick Stein and devoted to serving fish and seafood in the area. Stein has been pivotal in the resurgence of the enjoyment and general eating of fish and seafood in the U.K. Even though it is an island, England has not been known for its broad enjoyment of seafood and fish and many families have just not bought it preferring to buy meat products instead. This means that the bulk of our fishing is sold to Spain and France as they, on the whole, appreciate it more!! Crazy isn’t it? Especially as we are an island. This month as promised I am going to give you the variations of gazpacho: Salmorejo and Ajoblanco. 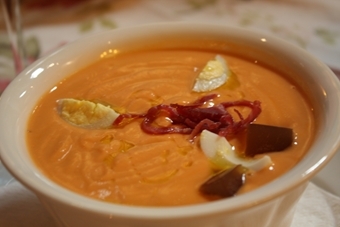 First Salmorejo; It is very similar to gazpacho but without the variety of ingredients that gazpacho has. It is a thicker version of the gazpacho I talked about last month and probably the earlier version of it as tomatoes only arrived in Spain much later on. It is generally served with chopped up egg and chopped up Jamon Serrano. Occasionally it is served with flaked tuna in olive oil. It is a typical dish originally from Cordoba, but now you can find it on most restaurant menus in Spain in the summer. It is offered in our local bar as a dip with bread sticks and a spoon. Below are roughly the ingredients, but you can experiment a bit as you may like the Salmorejo thicker than I do or indeed a bit thinner. If you prefer it thinner, add less bread or perhaps a little water. Careful with the quantity of garlic you use as it can be a bit more than you are used to. Chop the tomatoes, green pepper, and garlic coarsely. Put it all in a blender adding the bread soaked in a bit of water, part of the olive oil and salt to taste. Add some water just to reach a creamy texture. At the end add the vinegar and mix again. Check the seasoning, adding more salt or vinegar and maybe more oil if necessary. Serve drizzled with extra virgin olive oil and the `guarniciones´: chopped up hard-boiled egg and small chunks of jamon serrano or flakes of tuna in olive oil. 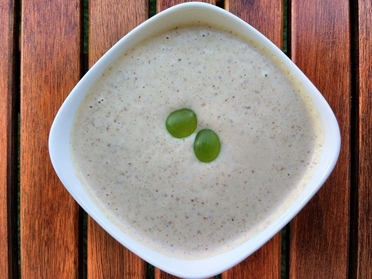 Ajoblanco is often referred to as white gazpacho. I imagined this was because it was just the cold white soup that is served in Spain, but after more research apparently some people put other vegetables blended into the soup making it more similar to the cold soup we know as gazpacho. As far as I understand this has never been the case. Ajoblanco dates back to the moorish Middle Ages. Tomatoes and peppers were introduced to Europe from the Americas and so the very first Ajoblanco would have been the original, very simple soup with pounded almonds, garlic, bread, oil, some sort of wine vinegar and water. In this case, the almonds are the star of the show rather than the ripest juiciest tomatoes. As with gazpacho there seems to be a few variations that could be correct or acceptable. It seems that this is the very beginning of where Gazpacho started. Almonds are an ingredient inherent to Spanish cuisine simply because there are almond trees all over Spain, especially Andalusia. The whole countryside is covered with them, becoming a beautiful patchwork of pretty pink almond blossom all over the Andalusian countryside during January and February. It is a breath-taking scene on a cold winters day, with the bright blue sky reigning from above. Actually, Ajoblanco is not a garlic soup as the name suggests as it does not contain so much garlic as it does almonds. The almonds are the white ingredient instead of the tomatoes that make gazpacho red. In Andalusia, they say it is best made with the brand new fresh almonds that have just hardened on the trees but still have their green husks. This happens early in the season which can often be the hottest time of summer as after July it generally starts to cool off, depending on where you are! When it comes to the bread, some say to soak the bread in milk. However I think this makes a far too rich (maybe even turning it into porridge rather than a refreshing soup) and I prefer not to add dairy to this recipe that is served in the heat of summer that it may add to the possibility for it going off rapidly. Traditionally the soup is served cold with chopped up fresh fruit either chopped white melon (typical to Spain called piel de sapo or ´toad´s skin´) or green grapes, preferably seedless. However prefer it with chopped up cucumber as I think it adds freshness, or chopped up avocado which I think adds unctuousness. Soak the bread in cold water for 10 minutes. Put the almonds into a blender or food processor. Squeeze out the bread and roughly tear into the blender, add a bit of the water and whizz for a minute or so until fairly finely ground. Then add the garlic and with the motor running, slowly add the oil and vinegar. If it is still very thick add some water to thin it down. Whizz until smooth, then season to taste. You can sieve it if you want though I don’t. Put it in the fridge and chill for at least 2 hours. To serve you depending on what you are using halve and seed the grapes if necessary or chop the melon into chunks or even use a melon baller if it is a such an occasion. You could chop up the avocado or the cucumber, depending on what you have decided. Then arrange on top of the soup and finish with a final few drops of oil. There is a delicious version of this Ajoblanco as a dip, similar to aioli and is great to serve with some bread at the beginning of a meal while friends are mingling and mixing. It is a mixture of day old bread soaked in water, raw almonds with skin on, peeled garlic, milk to thin down and salt to taste. Make it in mostly equal amounts…apart from the garlic! Now I think you have all the tricks to the best cold Spanish soups to enjoy this summer and delight you family and friends on hot summer days.